Another Shout! 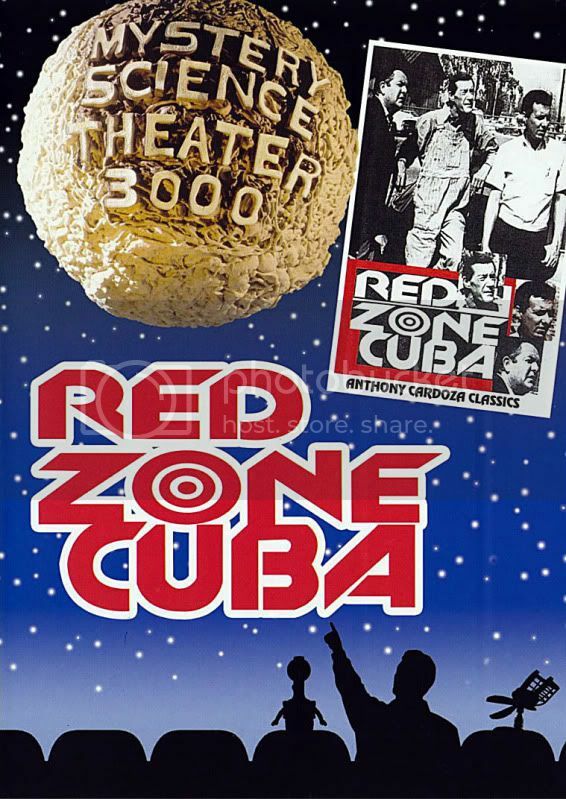 Factory Select title (only available through their website), Mystery Science Theater 3000 takes on the 1966 film Red Zone Cuba (just released August 16th, the same day as another MST3K title - The Unearthly). Red Zone Cuba is something that is hard to put into words, but one thing that I can say is that not only does it feature screen legend John Carradine but he also sings the theme song! Now that's something. As far as the movie itself though....that parts not so exciting. Red Zone Cuba really doesn't make a whole lot of sense. Actually it didn't make any sense. I have no idea what the movie was about and watching it, I didn't really care. I know it had something to do with Cuba (only because of the title) and it looked like something to do with the army and I think it took take place in the midwest. Wait, I thought it was Cuba? Crap, now I'm not sure. Does Cuba touch the midwest? I quit. Skipping over the synopsis because I don't think the film had any discernible plot, I'll go straight into the highs and lows. The only real highs I can think of (besides John Carradine's brief involvement) would be that some of the shots in the film (mostly of the dusty midwestern/cuban/wherever the hell it is terrain) were actually pretty nice. Of course those shots lasted only a few minutes at most so really the film itself was otherwise poo poo. Once again, Mike and his robot sidekicks do their duty of ripping the film apart. Jokes such as one of the characters resembling Curly from the Three Stooges makes this episode a good addition to Shout! 's already expansive DVD catalogue. Also included is a hilarious little short about public speaking called Speech: Platform, Posture and Appearance that also proves as a perfect target for the Satellite of Love's insults. If you order Red Zone Cuba along with The Unearthly HERE , you'll receive a free MST3K Stress Ball (you'll need it to get through this film).